COLORADO -- A Denver sheriff's deputy who pleaded guilty to a charge of animal cruelty for using Mace on a rabbit continues to oversee inmates at the Denver County Jail. Alvin Perez, 41, was suspended for two months without pay and then was reinstated, said people familiar with the case. The date of his reinstatement was not available Monday. A criminal complaint says that on May 28, Perez saw a rabbit near where he was standing outside the Denver County Jail during his break. He got a can of Mace and sprayed the rabbit for no apparent reason. Perez pleaded guilty to one count of animal cruelty and was sentenced in December to one year of supervised probation, a one-year suspended jail sentence and a $500 fine. GEORGIA -- A Forsyth County woman wants to know who got her goat. 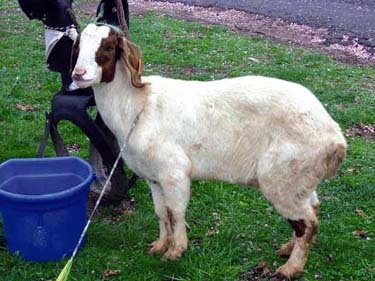 Sandra Scarboro's 18-month-old female Boer goat is recovering after being shot in the shoulder with an arrow over the weekend. The goat is expected to survive, Scarboro said, but she’s worried the incident on her Starrbrook Crossing farm in northwest Forsyth was deliberate. “I tried to feel in my heart that somebody didn’t do that on purpose, maybe somebody was training and the bow got away, but it didn’t look that way,” she said. According to a Forsyth County Sheriff’s report, parts of the camouflage arrow were snipped off to prevent further injury to the goat. Sheriff’s Lt. David Waters said the department's animal control unit is taking the investigation seriously. Waters said animal control officers will question residents in the area in an effort to find the shooter. Waters said the arrow appears to be designed for training and not hunting. He said whoever shot it could be charged with cruelty to animals, which is a felony. “If it was accidental, it’s still cruelty to animals, but it may be looked at a little different,” he said. According to the state Department of Natural Resources, archery season in Forsyth County, which allows for hunting deer and bear, ended in January. Scarboro said her husband discovered the wounded goat Sunday when he went to feed their animals, which include about 40 goats and three horses. “He saw some goats were gathering together so he walked over there and that’s how he found her,” Scarboro said. Scarboro said they took the animal to the veterinarian after talking with authorities. The Scarboros were told to turn in the remaining pieces of the weapon, once removed, for evidence. Scarboro said the goat doesn’t have a name. “Maybe we’ll call her Fortune,” she said, adding that the goat, which may be pregnant, was lucky despite its injury. She plans to distribute flyers about the incident throughout her area in the hopes of finding out who shot the animal. FLORIDA -- Two cats suffered so cruelly before dying, prosecutors say, that they decided to charge a Palm Beach County teacher with two felonies Monday. Police initially accused Allison Dinsmore, 26, of misdemeanor animal cruelty this month when her two cats' wasted corpses were found in her Boca Raton apartment. Investigators said the Congress Middle School teacher's cats clawed up the apartment in a frantic search for food as they starved for up to a month before they died. The corpses then rotted in the filthy apartment about a month before an apartment manager found them. Prosecutors upped the charges to two counts of felony cruelty to animals, saying her actions caused "excessive or repeated infliction of unnecessary pain or suffering." The new charges each carry a maximum penalty of up to five years in prison. Mike Edmondson, spokesman for the Palm Beach County State Attorney's Office, said the agency would not elaborate on why the charges were upgraded. Efforts to contact Dinsmore on Monday were unsuccessful despite phone calls and messages to the number listed on the crime report. A phone message and an e-mail to her Miami-based attorney, Jordan Lewin, weren't returned. Dinsmore told police in February that she had been working long hours at her school and spent a lot of time at her boyfriend's house. Police said she also went on a family camping trip while the cats starved. She said she couldn't remember the last time she had been home, but said she "thought" she had left food and water for her cats. Dinsmore is not teaching this week because schools are closed for Spring Break, school district spokeswoman Vickie Middlebrooks said. She couldn't say whether Dinsmore would be permitted to return to the Boynton Beach middle school when classes resume. "The school district will open up a personnel investigation based on the state attorney's action," Middlebrooks said. "The district will examine all of the facts." Dinsmore has worked at Congress Middle since August 2007 and has a clean employment record, according to the district. Her salary is listed as $36,100. The two cats were found dead Feb. 23 by a manager at Boca Sol apartments. Police said Dinsmore hadn't paid rent, and a manger went to her home to talk to her and check out the apartment. The manager found the two dead cats, signs of a frenzied search for food and water, and feces and urine everywhere, according to police. The smell was so bad, an officer had to cover his mouth with a rag when he first went inside, the report said. A necropsy determined the cats suffered neglect for weeks or months before dying a slow, painful death from starvation and dehydration. OKLAHOMA -- Authorities are looking for a second person in the case of a dog dragged behind a truck. One man has been arrested. Now, investigators say they need to identify a woman and there's a big reward for information leading to her identity. It's been five months since Sammy was a victim of animal cruelty. According to eyewitnesses in Creek County, he was tied to the bumper of a truck and dragged at close to 70 miles per hour for almost a mile. Sammy survived, but was severely injured. He's now taken care of by the people who saved his life at the Bristow Veterinary Hospital. "He just has the type of eye that uh, makes you, draws an affinity to him and that's what I saw the night that he came in. I saw an animal that wanted to live," said Dr. William H. Mitchell. The man witnesses say drove the truck, 20-year-old Cody Hahn, was arrested and bound over for trial on animal cruelty charges. But, witnesses say there was a woman with Hahn that day. They say she coaxed the dog to the truck and tied it to the bumper before Hahn took off. "This was such a serious case. 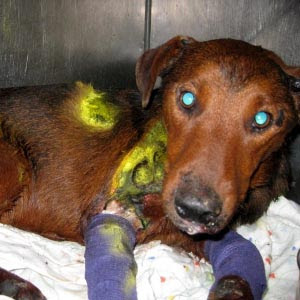 This dog was terribly injured. Umm, it was almost skinned alive," said Ruth Steinberger with Oklahoma Alliance for Animals. No one has said who the woman was. That's why the Oklahoma Alliance for Animals and the Oklahoma Humane Federation are offering up to a $5,000 reward for information leading to her identification. Note: She has since been identified as Cody Wayne Hahn's girlfriend, Rikki Leigh Seritt, 18, and has been charged with a felony and two misdemeanors. "We just feel it's very, very important that anyone in the community that are, anyone who has a little bit of information they think may be relevant contact the Creek County Sheriff's Office and let them know," said Ruth Steinberger with Oklahoma Alliance for Animals. Witnesses say they would recognize her if they saw her. "This was a horrible crime. We want to make a point across Oklahoma that this is not tolerated," said Ruth Steinberger with Oklahoma Alliance for Animals. 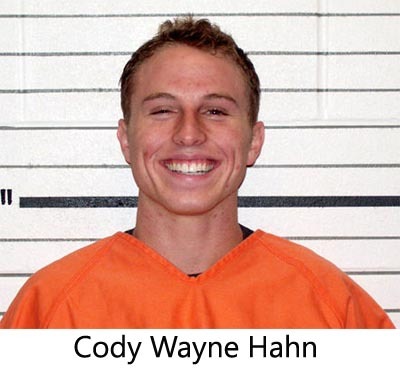 Cody Hahn was supposed to be arraigned on Monday, but it was delayed until July. Meanwhile, the Creek County Sheriff's Office will hold a press conference regarding the search for the female suspect this Wednesday at the Dog Dish in Tulsa. Anyone with information about the incident is asked to call the Creek County Sheriff's Office at (918) 224-4964. 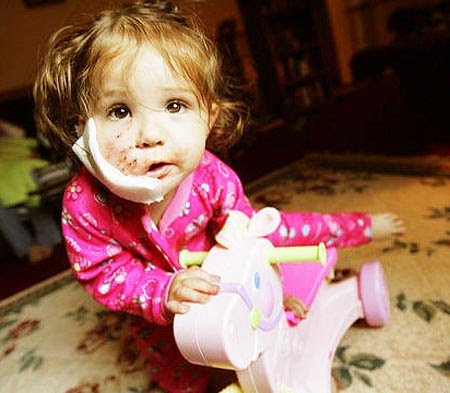 Massachusetts: Pit bull with history of attacks mauls 1-year-old girl in the face. Police refuse to respond to call. 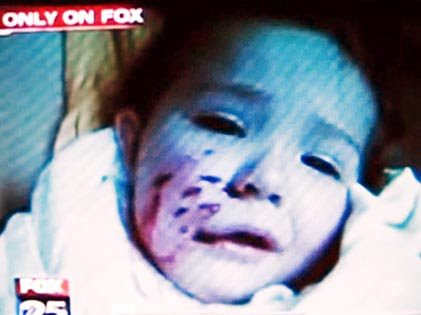 MASSACHUSETTS -- With her mom watching in shock, a 1-year-old girl was bit in the face by a pit bull, requiring the child to undergo extensive surgery and dozens of stitches. Bianca Zangari-Dacey had surgery Wednesday night and is out of the hospital, but her grandfather is angry, saying the dog had bitten other people in the past and should have been seized by police before now. Police said they have custody of the dog, which was removed from the 2 Jackson St. house where the girl was bitten. A detective will investigate and report back to police Chief Alan DeNaro and other officials in the department, who will decide whether the dog will be destroyed, said Deputy Chief Donald Thompson. Bianca's grandfather, Tim Dacey of Haverhill, said the girl and her mother, Katelyn Zangari of Haverhill, were visiting friends at the home of the adult pit bull when it bit the child's face at 3 p.m. Wednesday. Katelyn Zangari said her daughter had played near the pit bull named Duchess several times in the past, never with a problem. She said another person who was in the room with them on Wednesday apparently stepped on the pit bull's tail. The dog then turned in the direction of Bianca and attacked her face, Zangari said. 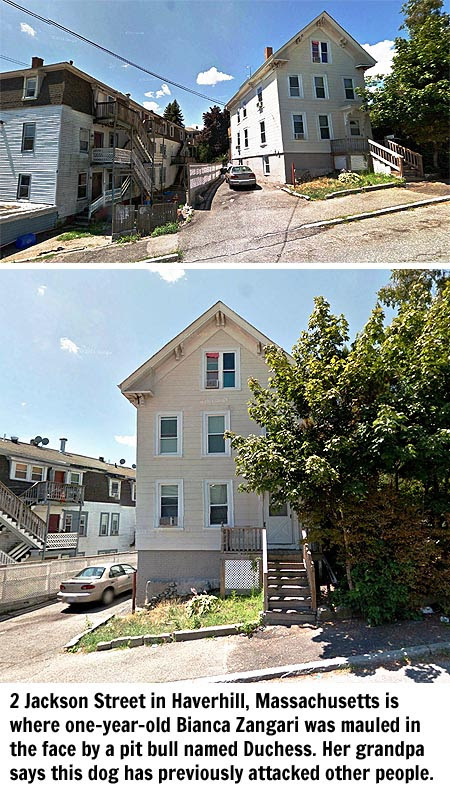 Zangari said people at the home took Bianca to Merrimack Valley Hospital. She was then taken by ambulance to Anna Jaques Hospital in Newburyport, where a surgeon stitched up the inside and outside of her face. "She had a big gash down her cheek,'' Dacey said. Zangari said her daughter needed at least 50 stitches in total. She said doctors told her they will have to wait until Bianca heals to determine whether she will need other treatment, such as plastic surgery to improve the appearance of the scars. Bianca was released from the hospital Thursday morning. She said her daughter was playing relatively normally yesterday, although she did occasionally say things like "Oh, oh, doggie.'' Family members said they and doctors will watch Bianca closely for signs of emotional scarring. "She's probably going to be traumatized,'' Dacey said. His son Justin Dacey is Bianca's father. Police said the dog's owner is Elizabeth Kakides of 2 Jackson St. Yesterday, Kakides said she was not home when Bianca was bit, but that once the child was cared for she made arrangements to give up the dog, which is about 5 years old. She said she signed papers with the animal control officer giving permission for the dog to be destroyed. Kakides said the dog was up to date on its shots. She said the dog was actually owned by her former husband, who recently had gone to jail, and that she was caring for the dog. She said the pit bull has been around Bianca many times and there was never a problem. She said she has spoken to Zangari and her family several times since the incident. What about the other victims of your pit bull? Zangari said she does not want to cause problems for Kakides, and that she does not hold her responsible for the attack. But Dacey said he is angry that the dog had not been seized earlier by police and the city's animal control officer, since it reportedly had bitten other people in the past, including an elderly woman in the Jackson Street neighborhood. 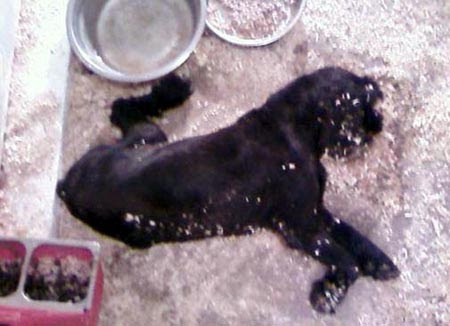 Dacey said he also is angry because when he called police to report the bite after it happened, expecting they would immediately seize the dog, they told him the animal control officer was unavailable and that they had other responsibilities at that hour, which was near the time of the department's shift change. Yesterday, Thompson said the case is under investigation and, besides the future of the dog which is at the city animal shelter, police have not yet determined whether the owner will face any fines or criminal charges. He refused to comment further. "We want to take a close look at this,'' Thompson said. Thompson said he would be happy to talk to Dacey about his complaint that police refused to respond properly to his phone call about the bite. Thompson said Dacey is welcome to contact him and police will review an audiotape of Dacey's call to the station. All calls from the public are recorded. Zangari said she expects the dog will be destroyed by police because of the attack. "They are going to put the dog to sleep,'' said Zangari, who added she was told by police to meet with them today to further discuss the incident. 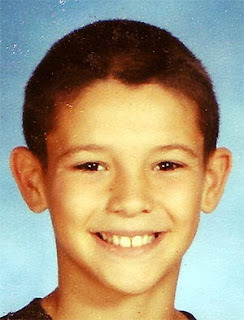 Robert Stickney Jr., 11, of Haverhill was bit in the arm and leg by a 100-pound mixed breed mastiff/pit bull while visiting friends at a High Street house on April 24, 2008. He needed hundreds of stitches to close his wounds. Three weeks earlier, professional dog walker Kathleen McCorry-Moge, 45, of Haverhill was attacked by an unleashed pit bull while walking a dog on Powder House Avenue. The dogs that attacked Robert Stickney Jr. and McCorry-Moge were euthanized, police said. UNITED KINGDOM -- A dog has been put down after it savaged a family pet and left it needing almost 100 stitches to its stomach. 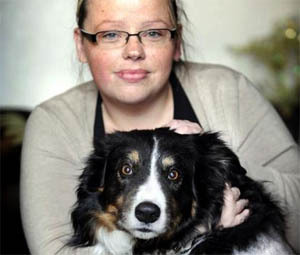 The animal, described as a “pitbull-type dog”, attacked a border collie in the street in front of its owner. 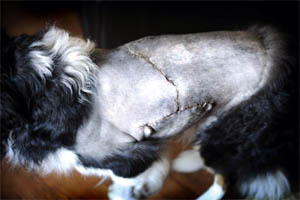 Kelly Gallagher of Springfield, Queensbury, said her family dog Sam, an 11-year-old border collie, was almost torn to pieces by the other animal. The attack lasted for up to 15 minutes and Sam required emergency veterinary treatment. 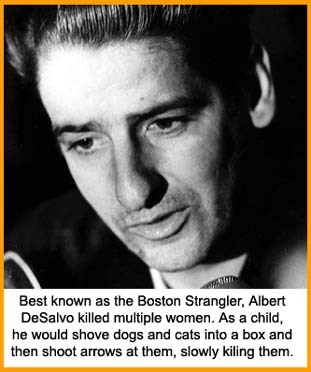 Miss Gallagher said: “He looks like two dogs stapled together – he is lucky he wasn’t killed. “I phoned the police and was told it was a problem for the dog wardens. I phoned them and reported the dog and they said they did not deal with ‘dog on dog’ incidents. Queensbury Councillor Michael Walls said: “I will demanding to know what is being done about this. As a dog owner and former policeman I would say it smacks of incompetence and a lack of compassion. John Major, Bradford Council’s Assistant Director Environmental Health, said that following the complaints the situation had been dealt with. He said: “We were first notified of the attack last Tuesday – even though we are told the attack happened on March 5. “We acted promptly and a dog warden visited her on Wednesday and the owner of the nuisance dog was contacted on Thursday. “The dog has been put down after the owner surrendered the animal to the dog warden service. He claimed to have taken the dog in as a stray in late February. 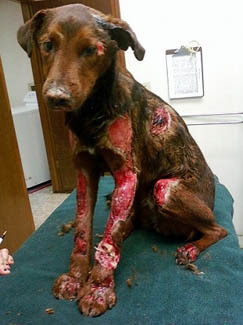 MISSISSIPPI -- The president of the Aberdeen school board was found not guilty last week on a charge of animal cruelty. During a hearing held March 17, Monroe County Justice Court Judge Kevin Crook, determined School Board President Michael Jackson had not practiced animal cruelty when a horse died while under his care. Jackson was arrested on the charges in January. The horse belonged to Nettleton Ward 3 Alderman Willie Brandon, who was studding the horse with Jackson''s, according to Justice Court Clerk Carolyn Carter. After being told repeatedly by Jackson not to worry, Brandon took it upon himself to check on his horse and went to Jackson's pasture to check on the horse, he found it dead and filed the animal cruelty charges. If you restrained your child in such a manner and left the child unattended and you came back and found the child dead, you didn't INTENTIONALLY cause the child's death but you caused the child's death by your negligent actions. The same for this poor horse. Shame on Monroe County Justice Court Judge Kevin Crook. MINNESOTA -- A jury cleared New York Mills dog breeder Kathy Bauck of two felony animal cruelty charges Tuesday night following several hours of deliberation. Bauck wept quietly and muttered “Thank you, Jesus” as the jury returned not guilty verdicts on her two most serious charges. During her testimony, Bauck said some of the injuries occurred after Smith placed dogs in the wrong pens, leading to fights. She said she reprimanded him several times during his two-month employment, which ended the same day a daily logbook went missing. Bauck’s husband and daughter are the owners of Pick of Litter Kennels as of April 2008. Bauck was the former owner of the facility and remains employed there. Following the verdicts, Brandborg requested representatives from the Minnesota Humane Society visit Pick of the Litter Kennels to ensure the safety of Bauck’s animals. Judge Waldemar Senyk ordered the four guilty verdicts be reported to the Humane Society and to the U.S. Department of Agriculture for their consideration. A sentencing hearing will be held April 24 following recommendations from Otter Tail County Probation. Five other charges against Bauck, including two felony-level counts, were dismissed in late January. 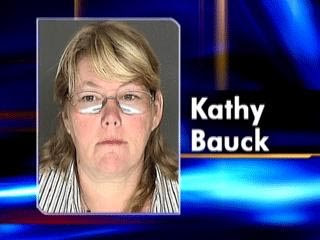 MINNESOTA -- Kathy Bauck took the stand in her own trial Monday, suggesting incompetence or sabotage on the part of her accuser led to injuries among her dogs. Bauck told an Otter Tail County courtroom she had never seen as many fights and seizures among dogs than during the two months Jason Smith worked at her New York Mills breeding facility last spring. 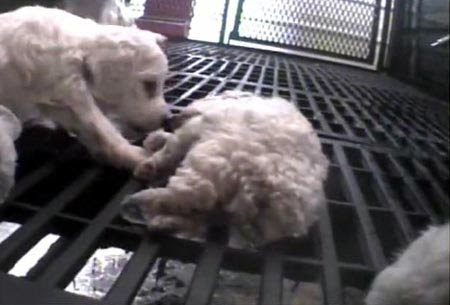 Smith has admitted he was hired by a national animal protection agency to work at Bauck’s Pick of the Litter Kennels. He took the undercover video used to bring charges of animal cruelty and torture against her. Bauck said she reprimanded Smith several times during the months he worked at the kennels. She described situations in which animals under Smith’s care had been grouped inappropriately while they were in heat, leading to fights and injuries among dogs. Bauck said she arrived at the kennels one morning to find Smith with a mastiff in the wrong pen. She moved the dog using its jowls because she was worried about a fight, she said, and Smith did not respond to her request to find a leash. In regards to dipping dogs, Bauck said she used an insecticide/water mixture to prevent fleas, ticks and other pests among animals. She testified she used a low concentration of the insecticide with small dogs, dipping them in a tank briefly before removing excess liquid and returning them to their proper kennels. She strengthened the concentration with larger dogs, but never submerged their heads, she said. Bauck also described a notebook used to log daily births, deaths, injuries, medication administrations and other events at the kennels. That notebook, stored in a breakroom and accessible to all employees, has been missing from the facility since Smith’s last day in late May, Bauck said. During questioning by the prosecution, Assistant County Attorney Heather Brandborg pointed out inconsistencies between dogs’ veterinary records and descriptions given by Bauck. Bauck said those details were listed in the missing logbook. Her daughter must have forgotten to add them to the medical records, she said. As her attorney read the charges against her, Bauck said she has never willfully abused an animal. Pick of the Litter Kennels is her family’s sole source of income and is currently under the ownership of Bauck’s husband and daughter, she said. OKLAHOMA -- A man accused of cruelty to animals in a dog-dragging case was arrested Wednesday on a complaint of intimidating a witness. 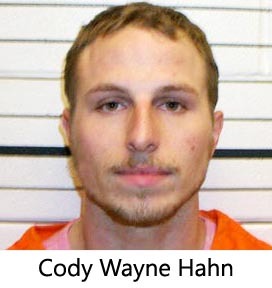 Cody Wayne Hahn, 22, was booked into the Creek County Jail after investigators say he threatened a friend who had tried to provide Hahn with an alibi. 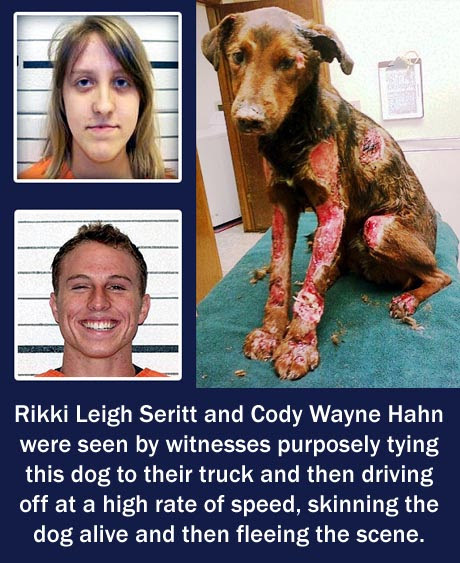 Anthony Teague told police that he was lying when he told the Creek County Sheriff's Office that he and Hahn had been in Tulsa at a Hibdon Tire Center when the dog was tied to a bumper and dragged in the area of 161st West Avenue and 63rd Street South on October 16, 2008. Investigator Gary Simpson said he contacted Teague when cell phone records indicated Hahn used his phone at the time and general location where the animal cruelty took place. 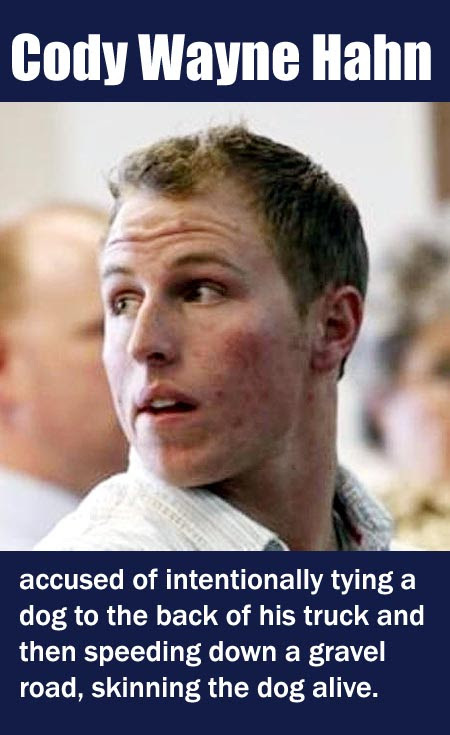 Teague recanted his alibi on February 25, 2011, telling investigators that he lied because Hahn was a friend and he was "trying to keep him out of trouble." On March 12, Simpson said Hahn contacted Teague with a threatening text that included the message "That's all good. Hope ur ready for jail time too." Hahn admitted to sending the message to Teague, adding that he was driving on the Creek Turnpike when he sent the texts, according to Simpson's affidavit. Hahn's girlfriend Rikki Leigh Seritt has also been charged. FLORIDA -- Two cats starved to death in a schoolteacher's apartment because, between work and her social life, she just didn't have time for them, police said. The black and brown, tiger-patterned domestic cats had names and traits, but by the time police found them Feb. 23 at a Boca Sol apartment, they were dead. The findings: They were trapped in the home of Congress Middle School special education teacher Allison Dinsmore without enough food and water for up to a month. They died a painful death, officials said, caused by dehydration and starvation. Police accused Dinsmore, 26, of cruelty to animals, a misdemeanor, though she has not been officially charged. Police could not arrest her, Officer Sandra Boonenberg said, because "misdemeanors must occur in the officer's presence or be a 'misdemeanor exception,' which animal cruelty/neglect is not." The State Attorney's Office will decide whether to charge Dinsmore. "The apartment was completely upside down," said Tina Alma, assistant manager. "They brought the ceiling down. These cats went crazy looking for food and water before dying." OHIO -- Workers at an educational farm are grieving the loss of two Shetland ponies used to teach children about agriculture. Employees of Learning Tree Farms said two pit bulls surrounded a group of Shetland ponies in a field last Wednesday. Witnesses said the pit bulls cornered two of the ponies and fatally wounded them by biting at their neck and groin areas. A third pony, named Goldie, was seriously wounded but managed to survive. Patricia Rau said, "I can't imagine the terror they felt, knowing they can't protect themselves." Rau said the pit bulls' owner met with animal control officers and agreed to put the pit bulls down. Still, workers at the farm are struggling to deal with the loss of the ponies. Rau said, "There's a piece missing [here]." ALABAMA -- Madison County Sheriff's investigators have arrested the owner of a farm where more than a dozen animals were found starved to death last week. Laura Ann Lane Lifer, 49, was charged with 14 counts of animal cruelty, a Class B misdemeanor, said Investigator Brent Patterson. Lifer is accused of allowing at least 14 animals -- including cows, horses, goats, rabbits, dogs and cats -- go without food on her land at 487 Hammond Lane in Toney. The animals were discovered March 4, when a passer-by noticed a "foul smell" coming from the area, Patterson said. "Since her sentencing she has sold her farm in Toney, AL and moved to McBurg, TN. She moved most of the animals to TN before her court date. She is hiding them there." An online search yields a result that says she owns property on Cathcart Road in Frankewing, TN. Another search states that she has lived in Pulaski, TN. 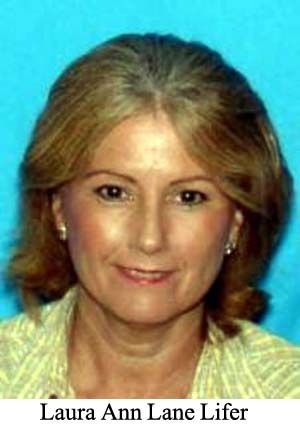 Records show that Laura Anne Lifer, 50, was arrested in Madison County, Alabama, on February 4, 2010. FLORIDA -- A pot-bellied pig that police confiscated after allegedly seeing its owner drag it down Duval Street died Thursday, prompting authorities to confiscate a second pet pig found living in squalor at the man's home. 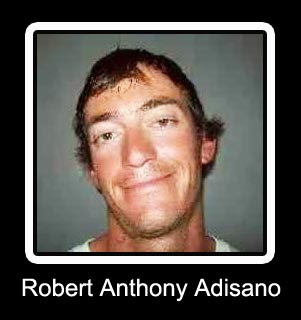 Robert Anthony Adisano, 25, of 210 Angela St. faces a felony third-degree animal cruelty charge stemming from the alleged pig-dragging early Wednesday. Authorities on Thursday agreed to file an additional animal cruelty charge regarding the second pig, and are researching still more possible charges, said Chuck Best, a spokesman for the Florida Keys Society for the Prevention of Cruelty to Animals. The charges so far could bring a maximum $20,000 fine and 10 years in state prison, said Monroe County Assistant State Attorney Patrick McCullah. Key West police arrested Adisano around 4 a.m. after an officer allegedly saw him dragging a squealing pig named Harriet on its back over broken glass in the 300 block of the street, reports say. Adisano, who had come from an unknown bar, told police in vulgar terms that he was using the pig to meet women, reports say. Other witnesses accused Adisano of kicking the animal, Best said. 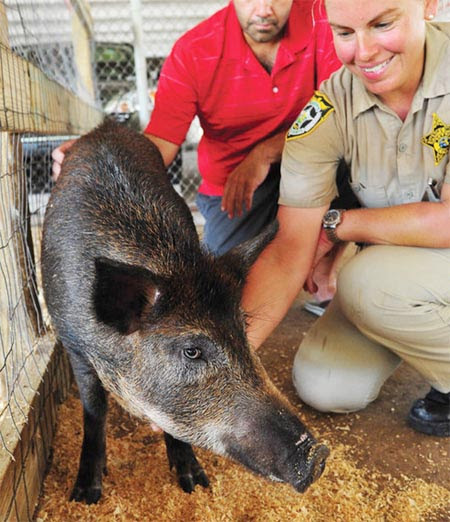 The pig's nose and mouth were bleeding when it died of internal injuries a short time later while in the care of the Florida Keys SPCA, Best said. Best then went to Adisano's residence -- apparently owned by two Georgia women -- and removed another injured pig living in a small cage barely bigger than the animal, he said. "It was living in deplorable conditions," Best said. "No food, no water, no shelter -- I got covered in blood just getting the animal to the shelter." Its only food source appeared to be a rotting fish, Best said. Shelter workers, who named the pig Sunshine, removed rocks and other debris embedded in its flesh, Best said. "It had a lot of lacerations and wounds that we sutured," Best said. "It's in stable condition right now and on plenty of antibiotics." Best said he was horrified by the treatment both animals endured. "We all know these are pigs, but this isn't a farm. Even people at farms don't treat pigs this way," Best said. "I don't think I've ever seen a case like this. I don't think a pig could be treated any worse. "No matter what kind of animal it is, it deserves to be treated with compassion. 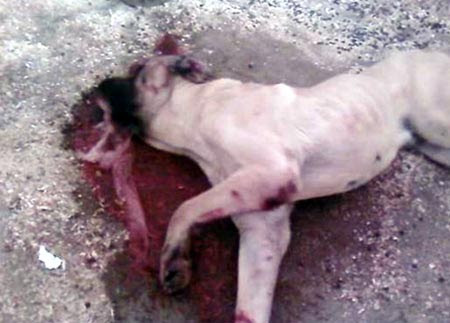 This animal had open wounds and was obviously in pain." Best was not sure where the pig will be sent after it heals. Adisano remains in Monroe County jail on $50,000 bond. His first court appearance has not been scheduled. OKLAHOMA -- A man accused of dragging a dog behind his truck will go to trial on animal cruelty charges. Cody Hahn had a preliminary hearing in Creek County on Wednesday. After the court hearing an impassioned debate over animal cruelty carried over into the courthouse hallways. The dog, Sammy, is alive and healing after Creek County Sheriff's deputies say he was tied to the back of a truck and dragged for almost a mile. 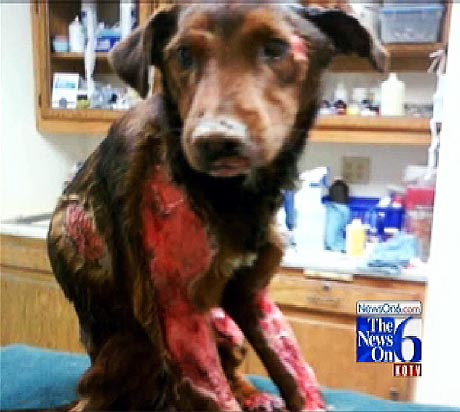 Deputies say 20-year-old Cody Wayne Hahn is responsible for the dog's injuries. After an eyewitness testified in court, Hahn was bound over for trial on a felony animal cruelty charge. The decision delighted a courtroom full of animal advocates, who want to see Hahn prosecuted to the fullest extent of the law. "I just think that it's a great thing that animal cruelty is being taken seriously," said Ruth Steinberger with the Oklahoma Alliance for Animals. "We need to tell other people out there that we won't take this. You're not going to get a slap on the wrist. You're not going to get community service. You're going to get the max, five years in prison for animal cruelty," said Lori Rusling, a law student. The defense argues that Hahn is innocent because he wasn't driving the truck, the photo lineup to ID him wasn't fair and because the dog was a stray. "I was disappointed. I don't think that stray dogs fall within this statute," said defense attorney Creekmore Wallace. The defense attorney claimed that because this dog is a stray it might as well have been a snake or a rabbit or a squirrel. That position really got some people riled up at the courthouse. "Well, I thought he was an ignorant fool. By what he's saying, it's okay to drag a squirrel down the road," said Ruth Steinberger with the Oklahoma Alliance for Animals. The group took their argument straight to Wallace, who debated the issue right outside the courtroom. One thing Wallace does know is people are passionate in defending animals and sometimes, he believes, a little too much so. "I know that we all have animals and we all have pets. 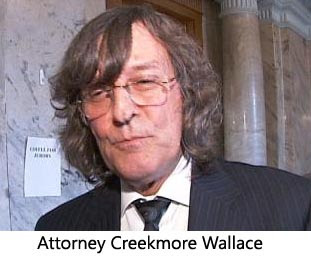 But, this is something that we have to take less emotionally and more realistically," claimed defense attorney Creekmore Wallace. Hahn will be back in district court at the end of March. If convicted he could spend up to 5 years in prison. His girlfriend Rikki Leigh Seritt also faces charges. St Bernards have become famous for leading daring Alpine rescues but one 16-month-old dog needed rescuers of its own after its tail was frozen to the ice on a golf course pond. MONTANA -- Gene Larson said his 118-pound dog, Duke, escaped from the family's garden on Thursday night. Rescuers believe the dog fell through the ice on a pond at a local golf course. While the animal was able to pull itself out of the freezing water, its tail got stuck, stranding it in the middle of the pond. A worker at the Peter Yegen Jr Golf Club in Billings, Montana, saw the animal on Friday morning and raised the alarm. 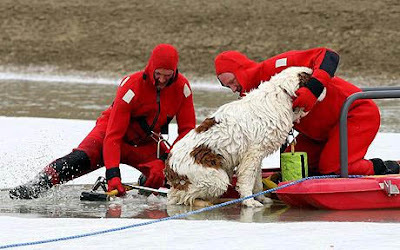 Firefighters had to break up the ice around the dog's tail before hauling the giant dog back to shore. The dog was later reported to be in good condition after being de-iced and warmed under a hair dryer at a local veterinarian's office. GEORGIA -- A Buford woman told a Gwinnett County judge this week a no-win ultimatum led her German shepherd to near starvation: with money tight, she was forced to choose between feeding her children or the dog, not both. The judge chose jail. Amanda Marie Conn was sentenced to two days in the Gwinnett County Jail on animal neglect charges Tuesday, followed by six months of probation, in addition to a $500 fine. She was released the following day, officials said. Trouble for Conn began when an anonymous tipster told police she was starving the animal. Animal control officers responded to her Branden Hill Lane address and observed "a very thin German shepherd," said Gwinnett police spokesman Cpl. David Schiralli. Conn claimed the dog had liver problems and was being treated by a veterinarian, Schiralli said. An officer told Conn he'd return the next day to verify records of the animal's treatment, which she failed to produce, Schiralli said. The dog was impounded, and its owner cited with animal neglect, per a county ordinance. Conn, whose phone number is unlisted, could not be reached for comment Thursday. Another stipulation of her sentencing forbids her from having contact with domestic animals, said Sheriff's Department spokeswoman Stacey Bourbonnais. As for the dog? Schiralli said officials concluded the animal had no liver problems or underlying medical issues, other than starvation. A veterinarian at a local animal hospital rescued the animal and adopted it, he said. "The dog recovered from his condition," Schiralli said, "and gained about 20 pounds in a very short period of time."